We get excited whenever an advertiser finds a new way to "get the word out". 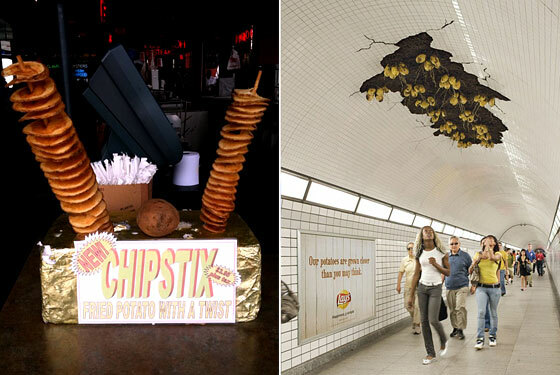 Lays found a very unique way of making an impression with their potato growing installation on the roof of a Chicago subway tunnel. Like They Need to Sell Us on Fried Potatoes? Copyranter isn’t at all amused that Lay’s has installed some fake potatoes in the ceiling of Chicago’s Jackson Tunnel to advertise that potatoes for the chips are “grown closer than you think.” The installation looks pretty cool to us, and you know what we also can’t help but love? An advertisement for Chipstix, fried potatoes on a stick, that we came across in Seaside Heights, New Jersey. Chipstix joins boardwalk monstrosities like the “Seaside Tony,” a cheesesteak with American cheese and fried balls of processed cheese, and, of course, the “Scooter pie,” which is similar to a fried s’more. 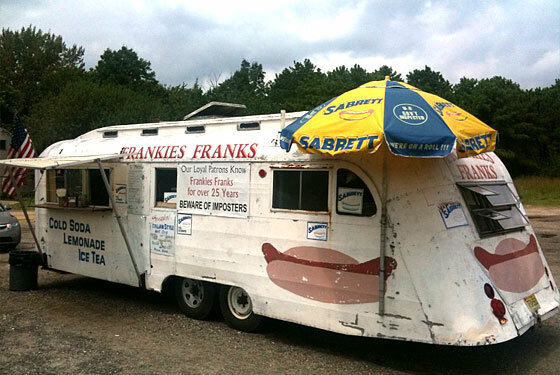 As irresistible as cheese balls are (see this clip at 4:50 to see what they can do to a man), nothing will ever replace the Italian hot dog (a dog with fried peppers, onions, and potatoes) in our hearts, and though we were too stuffed from the above-mentioned foods to try one at 25-year-old Frankies Franks of Brick, New Jersey, we did take a photo of their amazing setup to show you how food trucks are done in Dirty Jerz.